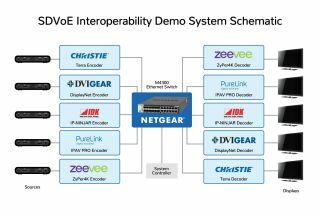 Standard SDVoE platform unites more than 158 AV products for matrix switching, AV processing and AV over IP. At ISE 2019 (Amsterdam, Feb. 5-8), interoperability demonstrations will be featured on both the LANG AG stand 1-H50 and the SDVoE Alliance stand 3-B150. In addition, an in-depth roundtable discussion of the benefits of interoperability for system designers, integrators and tech managers will be held on Wednesday Feb. 6 at 13:30 in room G109. Platform interoperability means that designers can create the system that best meets their customer’s needs, without the limits of a single provider’s catalog. Installers become more efficient because any training received on the platform gives them a baseline understanding of products built on that platform. End users appreciate the lack of “stranded investment”. It becomes possible to upgrade and expand their system without having to stick with the original provider, or throw out older gear. This reduces total cost of system ownership.